The craze for Hebrew tattoos is driven by the rising popularity of the language's symbolism for movie stars and other celebrities. As such, Hebrew tattoos have gained notoriety over the last few years, in trend with other tattoo art, thanks in no small part to figures like Victoria Beckham, Madonna, Britney Spears and Christina Aguilera. For some, a Hebrew tattoo can express a deep spiritual connection - whether for love, faith, or courage. For others, however, especially for those of a more Orthodox nature, Hebrew is a sacred language. The old guard frowns upon tattooing some words in Hebrew anywhere in the body (in fact, Leviticus 19:28 says, "You shall not make cuts in your body...nor make any tattoo marks on yourselves: I am the LORD."). As forbidding as the scripture might sound, Hebrew tattoos are still highly sought-after. The search for "Hebrew tattoos" on any engine will invariably bring up dozens of websites offering photos of Hebrew words tattooed on the skin, all with varying degrees of accuracy. The Hebrew script is quite complex; moving the placement of a vowel in the script might turn your declaration of "love" into "leather" -- or your "freedom" into a "vacation." Buyer beware! This only reinforces the necessity for an accurate translation for your Hebrew tattoo, especially if you plan upon having it done in consonants-only, as the script was originally written. Hebrew is written from the right to the left. The Hebrew alphabet has 27 letters. Hebrew is an abjad type of writing system, all symbols of the alphabet stand for a consonant and the reader must supply the correct vowel himself. Hebrew letters can also be used as numbers (common in the Kabbalah). There are as many designs for a tattoo in Hebrew as there are grains of sand on a beach, it seems, and all can be modified to suit one's personal taste. Most are of a religious or otherwise spiritual sort, with other symbols surrounding. By no means does this limit Hebrew tattoos to Jewish or Christian followers! Keep in mind that the Hebrew language is written from right to left - and make sure to double check with a native speaker before getting any permanent ink. It is quite possible that many of the free designs available are actually backwards...how embarrassing! The phrase "I am my beloved's and my beloved is mine" or "I am for my beloved and my beloved is for me" is the most popular translation request we receive. The phrase comes from the Song of Songs in the Hebrew Bible. The song is about fidelity and is often engraved on wedding rings. It must be the most popular Hebrew tattoo design as well. The love a woman has for her lover. The love the people of Israel have for God. Furthermore, in modern Hebrew (as opposed to Biblical Hebrew), Dod means uncle. Using the female version of dod, doda, would bring the phrase in the realms of modern Hebrew and would express the love of a guy for his aunt, which is at least said a bit peculiar. Trying to make the phrase masculine would disfigure it. Both Victoria and David Beckham have the Hebrew script for the above "I am my beloved's and my beloved is mine, who browses among the lilies" as a tattoo. 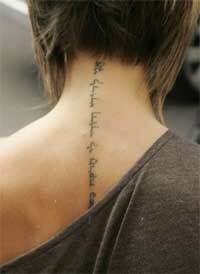 Victoria Beckham has her tattoo design on her upper back, following her spine. David Beckham's tattoo is on his forearm. The Hamsa (aka Hand of Miriam) is a Hebrew symbol used to protect against the evil eye. It is used on charms, but also as a tattoo design. Sometimes the hamsa tattoo is combined with fish images (Jewish symbol for good luck) or Hebrew prayers. The Hamsa is also known in the Arabic world, as Hand of Fatima or Eye of Fatima. Madonna, in one of her more recent music videos for the "Die Another Day" James Bond film, displayed a Hebrew tattoo on her upper arm. The Hebrew script she chose to display did cause some controversy. She has the letters "lamed", "alef" and "vav" tattooed on her shoulder, but those letters don't form a Hebrew word. At first, it looked as though it were simply stylish gibberish - and many dismissed it as such, another flagrantly displayed international spelling mistake. As it turns out, however, Madonna's tattoo had deeper meaning. Rather than simply being a word in Hebrew, it was one of the many names for God as written in the Kabbalah. Legend has it that each name of God in the Hebrew language has an empowering effect, gracing the speaker (or in this case, the bearer) strength of mind, presence of faith, the will to subdue the ego, and so forth - another reason why Hebrew tattoos are so popular today. 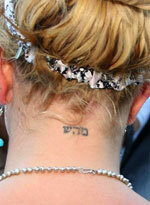 Britney Spears had a Hebrew tattoo as well. Following her friend (at that time) Madonna, she had the characters "mem", "he" and "shin" tattooed on the back of her neck. Together the characters form one of the 72 words for God (Kabbalah). Reportedly, the first version of the tattoo had an error in it that made the word meaningless. Later, she had this corrected. She had the Hebrew tattoo lasered off somewhere in 2008. Christina Aguilera has a Hebrew tattoo on her left arm. She has the characters "Yud" and "Bet" surrounded by the Spanish text "Te Amo Siempre" ("I love you always"). The Hebrew characters are the initials of her boyfriend Jordan Bratman. Yud (Y) is used for the J (the J doesn't exist in the Hebrew alphabet) and Bet is B, so: JB. 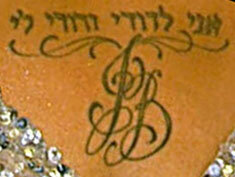 Christina has another Hebrew tattoo on her lower back, the popular "I am my beloved's and my beloved is mine"-tattoo.